We’ve published a lot of games and other stuff at Avalanche Press: 104 boxed games and 126 supplements (give or take a couple, depending on how you want to count different editions). 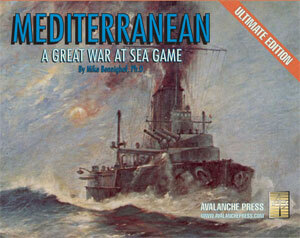 The game at the center of all that remains Great War at Sea: Mediterranean. A distributor once hailed Mediterranean as “the game that saved board wargaming,” and while that’s probably a stretch (probably), the game has been fundamental to the continued existence of Avalanche Press, both via its own sales and the multiple series that have spun off of it. That makes Mediterranean my favorite Avalanche Press title for more than just sentimental reasons despite the pedestrian title. So when our stocks of Mediterranean finally started to give out, it was time to activate long-standing plans for a new edition. The Ultimate Edition, so-called because it’s likely to be the last version of Mediterranean that we’ll ever publish. With years to consider just how to improve Mediterranean, and to trim back the desire to make it so overblown with extras that no one would ever want to play it, Ultimate Edition seems like a good name for it. First off, the Ultimate Edition needs to retain all of the game’s good things. Over the 20 years since its initial release, Mediterranean has sold well for a number of reasons. First off, it’s pretty easy and intuitive to play. You plot the movements of your fleets on the operational map (there aren’t many fleets in play, so that’s not as hard as it sounds) a few turns ahead, and when they meet up, you fight. You resolve combat by rolling dice, and hitting on a 6. You roll more dice to see where that hit landed on the target ship. Then you mark off damage on ship data sheet, and see if the ship sinks. Little ships sink fast; battleships are hard to sink. Second, it’s a colorful game. The previous edition included ships from Britain, Germany, Japan, France, Italy, Austria-Hungary, Greece, Bulgaria, Romania, Imperial Russia and Ottoman Turkey. Third, there’s a lot of game in the box: 70 scenarios in the previous (what we called “Deluxe”) edition. And fourth, those scenarios add up to a lot of history. A while back, I wrote a publisher’s overview of the Deluxe Edition, and in it pondered the things I’d do over again, given a chance to re-write the game. That chance came sooner than expected, and I’ve taken full advantage of it. The Ultimate Edition is the ultimate “if I had it to do over again” project. First off, the game needs to remain easy and intuitive to play. In fact, it needs to improve on that score. We’ve prepared a new edition of the Great War at Sea series rules, the first such in over 15 (fifteen!) years. It speaks well for the system’s underlying soundness that the rulebook has remained in heavy use for that long a period. We definitely don’t subscribe to this little industry’s “fix it in the living rules” attitude. Over the years, we’ve added some additional rules and some clarifications in the “special rules” section that leads off each game’s scenario book (or appears in a book supplement). Those will now be part of the core rules. And there will also be nice full-color playing aids like fleet organization cards. Not that you really need them to play, but they do add to the atmosphere. And that’s part of the fun. Next, we’ve got more color. Not just in the full-color cards, but more ships for the existing 11 fleets (these are actually necessary, since we’ve expanded the scenario set as well – see below). Some of the ships have revised ratings to bring them in line with the rest of the series. In addition to the ships, the aircraft are updated to match the rest of the series, too. And we've got more new fleets: Spain, Yugoslavia, White Russia and Red Russia. Best of all, we’ve done away with the worst feature of the previous editions: the “alternate play backs.” Now the flip side of the playing piece has the plain silhouette on a blue-gray background, both banishing the ugliness and making the game play the way it’s supposed to. There’s also a completely new map, which is slightly larger than that of the previous edition. It fully covers the Black Sea and Mediterranean and stretches out into the Atlantic. Plus it’s by Guy Riessen, so it looks way better, too. And then there are the scenarios. The Deluxe Edition had 70 of them, which is a lot by any measure. It’s not enough. Since designing the Deluxe Edition’s scenarios, I’ve come to view game design and publishing somewhat differently. Well, radically differently, but in terms of a game’s scenario set I don’t see things as I once did. A scenario is simply a different way to play a game. Some games have just one scenario, others have many. Games like Great War at Sea and Panzer Grenadier have huge numbers of scenarios, allowing players to re-fight lots of different battles. The idea’s a very old one in wargame publishing, certainly well preceding my awareness of the genre. When we founded the original Avalanche Press, we made putting many scenarios in our games one of our hallmarks to help set them apart from the games of other publishers. While the large scenario sets certainly did (and do) set our games apart, they’re not much of an advance in the state of the art from the 1970’s. They’re well done and include a lot of history and play value, but they each stand alone. There are more scenarios, particularly more battle scenarios. And we’ve broadened the game’s coverage to include incidents like the 1908 Bosnian Crisis and the naval operations that could have ensued. The scenario set now tops 100 scenarios. It’s a weighty set of text and it has more than just a veneer of history; the scenarios are integrated into the story line, to tell you about naval operations in the Mediterranean and Black Seas between 1914 and 1918, plus some other wars that happened or could have happened before or after the Great War. It’s creatively very satisfying to write, and I think the players are really going to like it – at least they have in the similar format we’ve used in recent Panzer Grenadier and naval series products. You don’t get many do-overs, whether it’s a major life decision or something trivial like a game design. The New Avalanche Press is nothing if not a basket full of second chances, and I’m grateful for all of the opportunities to do things over, both large and small. This do-over is one that should provide a lot of fun. Don’t wait to put Mediterranean Ultimate Edition on your game table! Join the Gold Club and find out how to get it before anyone else! Mike Bennighof is president of Avalanche Press and holds a doctorate in history from Emory University. A Fulbright Scholar and award-winning journalist, he has published over 100 books, games and articles on historical subjects. He lives in Birmingham, Alabama with his wife, three children and his dog, Leopold. Leopold needs no revisions.